These bouncy toys are a hop in the right direction. Beyond the giggles and play, these little hoppers promote body coordination and balance for toddlers. Unlike the average bouncy toy, these have tough, BPA-free skin as well as plump ears and legs for grip and support. 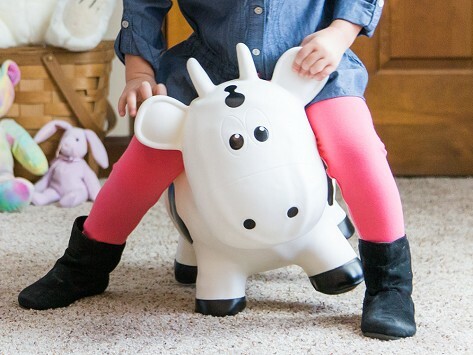 Each animal comes with a pump, so your little one will be riding around in no time. Dimensions: 22" x 17" x 9"
My youngest Grandson loves playing with this and bouncing all around. Gave to our 2 and 1/4 year old grandson for Xmas. He was a bit scared at first and fell forward the first few times he tried to move. After a few minutes of our showing him how to bounce, he is now absolutely inseparable from "cow". The product is made out of a strong, durable material and is now his favorite go- to toy! This was a huge hit at my niece's birthday party. All of the kids had a blast and even parents loved it! With these colorful, bouncy toys your little one is a hop away from improving coordination and burning a little energy. 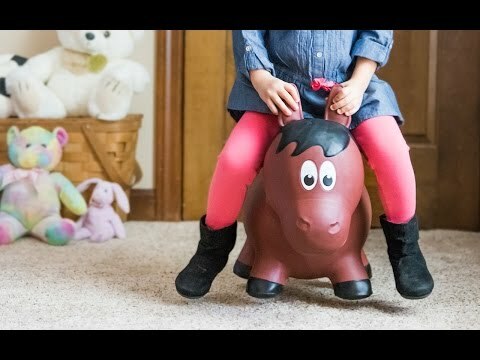 Farm Hoppers are loaded with buoyant personality—making them a perfect ride for the little ones. They’ll get their wiggles out and hone their motor skills while they’re at it. Each Hopper’s chubby legs and ears not only add to their overall cuteness, but give kids a better grip and added support. Plus, their vibrant skin is BPA-free and fit to survive any excited bounce, scoot, or sway. In fact, Joseph Bensadoun (the President of Next Generation Distributors) tested this Grommet with adults to make sure that the thick PVC would hold up. It sure did—however these little hoppers are really meant for kids so make sure to stick to the posted weight limit. Open the barn doors to give toddlers a workout and parents a chance to observe the fun.